Improved with Natural Ginger and Flax Seed Oil. FREE Standard Shipping on everything! Super Colon 1800, the faster and safer way to quickly drop pounds and a flatten your belly. Made with 100% All Natural Ingredients! The Super Colon 1800 is a very high quality colon cleanser that can help detoxify your body. It works to cleanse your digestive system from toxins and waste, making you feel lighter, completely energized and overall healthier. Some of the more generic detoxification aids out on the market can cause upset stomach, diarrhea or chronic stomach pain. But Super Colon 1800 is considered safe to use when taken as directed. And we have received no complaints that Super Colon 1800 have caused any side effects. Made in the USA in a high quality FDA Registered cGMP certified laboratory that follows strict Good Manufacturing Practices (GMP). ✓ Detoxifies the body by flushing our excessive waste and toxins. ✓ Flattens the stomach, giving the body a thinner appearance. ✓ Promotes natural & healthy weight loss by improving digestion. ✓ Boosts energy and promotes overall better health. Made with 100% All Natural ingredients with Anti-Oxidants! One bottle of Super Colon 1800 contains 60 capsules. You only need to take one capsule (up to 2 capsules) per day with an 8 oz glass of water.Then the Super Colon 1800 cleanser will begin to work its magic. Take only as directed and do not exceed recommended dosage. Consume plenty of liquids during the days you are using Super Colon 1800 for best results. 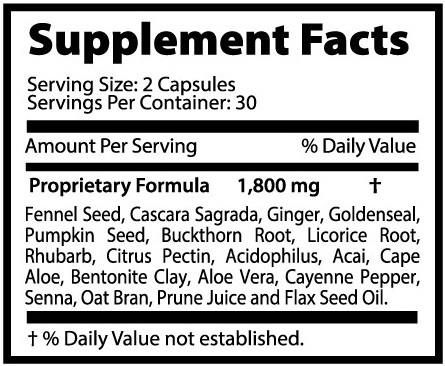 Super Colon 1800 is not intended for pregnant or nursing mothers, or children under the age or 18. Super Colon 1800 should not be taken for more than 7 consecutive days in a row. Failure to have a bowel movement after the use of this formula could be an indication you may have a more serious condition (unrelated to the use of this colon cleanser). Should constipation or difficulty having bowel movements still occur after using, consult your doctor/physician.